Oops! Poonam Pandey Exposes Too Much In This Picture On International Yoga Day! Controversial queen, Poonam Pandey is back in the limelight and this time for sharing over exposed picture on International Yoga Day. On the occasion of International World Yoga Day, each one has been sharing their fitness moment on social media. From PM Narendra Modi to Bollywood celebrities Malaika Arora, Juhu Chawla, and many others took to social media to share the pictures of them doing yoga. However, the only actress who has managed to grab attention for wrong reasons with her yoga picture is none other than Poonam Pandey. There is no doubt that Poonam is synonymous to boldness. From stripping for team India to her controversial videos on social media, Poonam Pandey has always been in the limelight. While other stars are sharing pictures to inspire to stay fit, Poonam Pandey is intending something else, we guess. 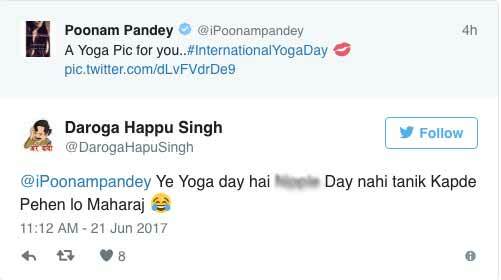 Poonam posted a picture of herself doing yoga on the occasion of International Yoga Day. The Bollywood starlet has exposed a little too much in the picture, which has caught everyone’s attention. Yoga is fine When it is inspiring to gain energy.. But the pic is inspiring to loose energy..
Only god knows ur intentions,what u intend to do with ur tweets…. Poonam Pandey was last seen doing a special appearance in the 2017 film ‘Aa Gaya Hero’, which starred Govinda. Good Morning Tweethearts!! #AskPoonamPandey Segment Two coming on my App soon 🙂 ? Previous articleTV Actor Shakti Arora Finally Reacts On His Break-Up With Neha Saxena! Next articlePhotos: Bipasha Basu And Karan Singh Grover Inhale Love And Exhale Hate On International Yoga Day!